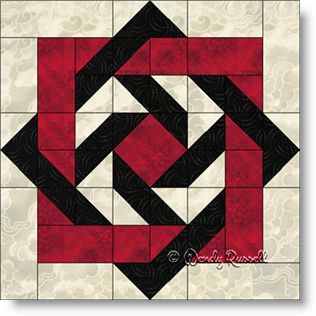 The Slip Knot quilt block is a bit of an optical illusion, in that it appears that fabrics weave across each other. This is technically an eight patch as it is designed on an 8 x 8 grid, but I like to sew this block as an uneven nine patch because I find it easier to work in "chunks" instead of rows. However, please feel free to construct as you like. This block contains simple patches -- squares, rectangles, half square triangles and flying geese. The challenge is that there are many pieces, and many seams. So, if you pay close attention to sewing a precise quarter inch seam allowance, you will find this block goes together easily. The two sample quilts illustrate different versions of quilts set on point, so you are only limited to your imagination to create your own original design. Enjoy!